Our Parent site for custom designed accessories for your self, family, and home. Let us help give your wedding a unique look. From invitations to programs, we can give you the look you want to achieve without hurting your budget. We offer everything from your print ready files to paper, printing and assembly services. Our products include full invitation packages, custom maps, monograms, save the dates and any other designs that will make your wedding stand out. Lano Company offers unique gift ideas for the wedding party as well as guests! Check out their one-of-a-kind Swarovski accessories and sensual massage oil candles for the romantic honeymoon night! The whole site really is a must see! Mention The Gartermaker and get a FREE gift with your order! 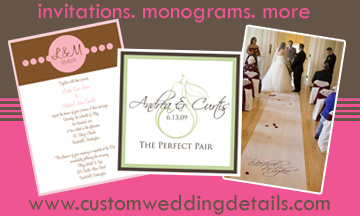 Custom Wedding Details specializes in personalized attention and customer service for all of their custom made products! The products we offer include: Custom Wedding Monograms, Invitations, Sticker Labels (Varying types), Hang Tags (Varying types), Thank You Signs, Hand-Painted Aisle Runners, Cake Toppers and More! Shavon makes gorgeous bouquets, flowers for your attendants, and even home arrangements! Looking for a custom aisle runner? Contact Julie and she will take care of you! They make beautiful aisle runners, including monogrammed and themed! LanoLuxury's beautiful Swarovski accessories make perfect bridesmaid's gifts! And their other products are wonderful as well! Try them, you won't be disappointed.